These fatality estimates used by the Times should therefore be viewed with an understanding of the inherent difficulties of reporting from within Syria, and the conscious or unconscious biases often found within NGOs. The VDC categorization and numbers conflict significantly with those published by the Syrian Observatory for Human Rights (SOHR), a human rights NGO based in London—as you can see from the SOHR chart at the very bottom of this post. Even the UN Office of the High Commissioner for Human Rights decided to stop providing public estimates of casualties in January 2014, because it could no longer guarantee that the source material for its estimates was accurate. Nevertheless, the Times’ presentation of the VDC data is illuminating for policy discussions about whether and how to intervene militarily in Syria. Consistent with earlier analyses, most people who have tragically lost their lives in Syria are not civilians, but rather active combatants. This is worth bearing in mind when U.S. Senators repeat the inaccurate statement that Syrian President Bashar al-Assad has “massacred” 200,000 of his own people. The Syrian security forces under Assad’s authority have perpetrated an untold number of war crimes and crimes against humanity, and as the head of state he must be held accountable by a post-conflict special tribunal for Syria. However, those advocating the use of force to protect civilians should recognize that there first must be an end to the fighting between the combatants, within which civilians have suffered and died tremendously. More specifically, as I wrote almost two years ago, any proposal for using force to protect civilians in Syria must take into account how noncombatants are actually being killed and injured. Note that of the 85,404 civilians estimated to have been killed (by both regime and rebel forces) by the VDC, just 22 percent were killed by Syrian government air attacks. (This includes over one hundred civilians killed by air-launched missiles while shopping in a Douma marketplace on August 16.) Those who propose a no-fly-zone (NFZ) or “cratering” Syrian Air Force runways should recognize that these tactical responses will do nothing to save the lives of most Syrian civilians. Moreover, as was the case with other NFZs throughout history, the Assad regime will simply reprioritize its offensive operations from air power to infantry and artillery attacks, which combined are already killing most Syrian civilians. 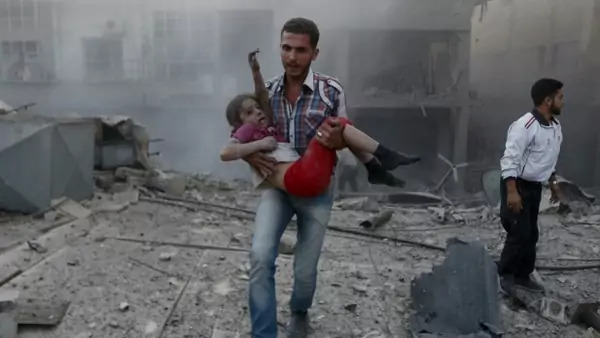 Of course, the United States and a coalition of outside states could intervene in Syria to protect civilians from such infantry and artillery attacks, as well as the many disappearances by the regime and rebel forces. I have written about what these time-tested military countermeasures consist of: counter-sniper tactics, counter-battery radars and fire, and infantry “movement to contact” operations to clear out Syrian and pro-government militia ground forces that threaten civilian populations. Yet, these operations require a level of cost, commitment, risk, and uncertainty that intervention proponents are apparently unwilling to accept, including a significant number of the unthinkable—“boots on the ground.” So when policymakers and pundits advocate intervening in the Syrian civil war to save civilians, consider whether their proposals would actually achieve this intended objective. Sources: Violations Documentation Center, September 14, 2015; Syrian Observatory for Human Rights, August 5, 2015.